How Have You #CrushedIt Today? | A Savings WOW! How Have You #CrushedIt Today? 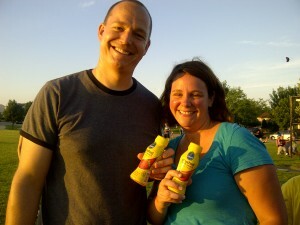 We had the opportunity to try out Chiquita crushed fruit snack product and they are so delicious! If you haven’t tried them yet, we definitely recommend it! Visit Chiquita’s Facebook page for more information about them. Part of Chiquita’s mission is to have people share how they have #CrushedIt, including finishing a huge project, helping a non-profit, working out consistently, etc. The way I #CrushedIt was to get caught up with our laundry. That may sound like an easy task, but it wasn’t for me because our washing machine has been broken for the past month and the part finally came in and they repaired it, so the task of catching up with laundry was a daunting one. We finally have a full stash of clean clothes again and are very happy about it! We were also given the opportunity to share $25 worth of Chiquita crushed fruit snack product with someone in our community who we thought #CrushedIt. We chose Becky and Joe, who have been very active in putting together events in our community to help bring neighbors together, including a T-Ball/Baseball League, Easter party, 4th of July party, Christmas Tree lighting, and Halloween bash. It’s through their hard work and dedication that we’ve been able to grow as a community and also have our children enjoy the fruits of us all coming together to make the events successful. All of these events are made possible from the neighborhood volunteers who donate their time and supplies! Our kids have enjoyed the T-Ball/Baseball league, learning a new sport for them and making new friends! Congratulations, Joe and Becky, for having #CrushedIt! We’d love to hear how you’ve #CrushedIt! Leave a comment on their Facebook page with how you’ve #CrushedIt! You can also follow them on Twitter to see how other people have #CrushedIt! Disclosure: This project has been compensated as part of a #CrushedIt mission for Chiquita through #CollectiveBias. All opinions are my own.